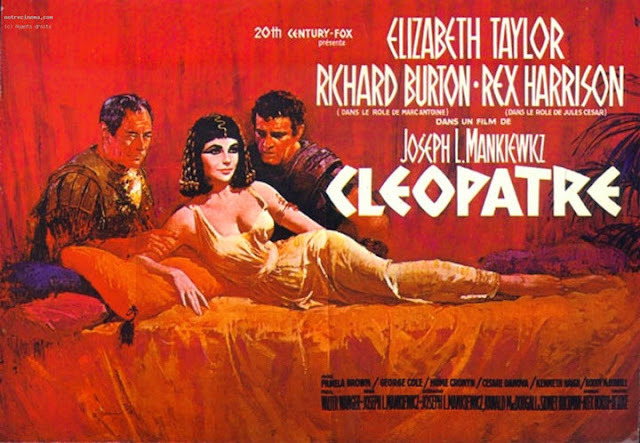 If 'lavish' is the singular term to bestow upon the historical epics of the Fifties and Sixties, Cleopatra exceeds the term in every way, making it clear from the get-go of its four-hour running time this, adjusted for inflation, is definitely one of the most excessive and expensive movies of them all. 20th Century-Fox sure wasn't thrilled by that fact at the time, as it nearly pushed the studio into bankruptcy. Nevertheless, it persisted in the project (since cancellation would have been its death sentence for sure) and today it remains a testament to just how staggeringly detailed and rich a movie can be made to look if enough money is thrown at it. In many ways, Cleopatra is not one, but two movies: director Joseph L. Mankiewicz always intended for it to be released in two parts (a decision the home cinema release has honoured by splitting the movie in half, spread over two discs). The first would have been called Caesar and Cleopatra, its sequel Antony and Cleopatra, as the movie conveniently cuts from one male protagonist to the other around the middle of the film, with the Queen of Egypt the constant that unites them both in a tale of passion, decadence, lust and glory. Grand diva Elizabeth Taylor plays her most iconic role of all as the young queen that finds herself in the middle of the plots and intrigue at the Egyptian court of her brother who means to dispose of her, only to be saved by the older Roman general Caesar (a thoughtful and intelligent, but undeniably ruthless and pragmatic character portrayed by Rex Harrison) who, compelled by her wit and charm, instead forms an alliance with her and gets rid of her treacherous sibling. Said union spawns a son, Caesarion, which gives her an incentive to make a claim on the rule of Rome when his father is murdered in the Senate. Enter his boorish, no-nonsense second-in-command Mark Antony (the notorious Richard Burton) who has his own notions on the matter, but swiftly is suckered into Cleopatra's web of passion too, an affair destined to end in tragedy. Ironically, Taylor and Burton couldn't keep their hands off each other in reality as well, leading to one of the most scandalous and infamous love affairs in Hollywood history that made Brangelina look second rate. Keeping the affair in line as well as could be managed – basically, not at all, thanks to Burton's loudmouth persona – to avoid overly devastating public scrutiny, coupled with the ever rising production problems and outrageous costs (driving a movie originally budgeted at 2 million dollars to a whopping 44 million dollars), drove many a Fox executive close to madness, but over the years Cleopatra made a decent recuperation for the studio and even turned a bit of a profit. Audiences sure got what they payed for: an outrageous epic-to-end-all-epics with a scale and scope still unsurpassed, using some of the biggest sets ever created, populated by thousands of extras and a diverse range of wild beasts, all just as background material. And unlike the digitally saturated present day, it was all there in the flesh, making the sets look as spectacularly opulent in real life as they appear on film. Of course the fabulously rich enviroments where secondary only to Taylor's magnificent performance as the young monarch, at first relying on her sensual beauty and ever underestimated intelligence for her own basic survival, but soon applying both to make her country and herself a top player in Mediterranean politics by going head to head with the might of Rome in a love affair with one of its most powerful men that is bound to destroy an empire, and ultimately herself as tragedy ensues. Taylor definitely dominates each scene and won't allow the bombastic sights to take centre stage. She is aided by a grand cast which includes the likes of Roddy McDowall and Martin Landau, only tools for her to play off against as they can't compare with her majesty. Nevertheless, because of the endless show of grandiose sets, sexual plotting and Roman violence it cannot be denied Cleoptra feels like it's dragging on too long, which convinces the audience cutting it into two separate pieces would probably have been for the best. Even so, Cleopatra remains one of the most sensational movies ever produced, its history as wild and epic as the history that inspired it.